After a recent report that 2.6 soldiers per 1,000 were sexually assaulted last year, the Army has finally vowed to prevent these sorts of crimes. According to the Wall Street Journal, the Army's previous strategy did not involve preventing rapes, but a post-assault plan put in place in 2004 after a number of high profile assaults came to light. 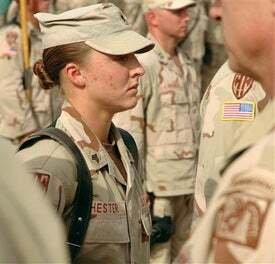 The 2004 plan "focused on deploying 'sexual assault response coordinators' to all military installations and expanding the range of counseling services," the Journal reports, while the new plan, called "'I AM Strong' — the I AM stands for 'intervene, act, motivate'" — aims to prevent sexual assault through education.The Army is now encouraging soldiers to confront inappropriate sexual comments and alert higher-ranking soldiers about misconduct. However, many sexual assault advocates point out that this encouragement runs counter to the Army's entrenched culture of deferring to highly ranked officers. Army veteran Susan Avila-Smith, who runs the advocacy group Women Organizing Women, tells the Journal, "Most people keep quiet because they don't want to believe it happened to them or because they're scared of what will happen if they speak up." The Journal also quotes former medic Ellen Wainwright, who says she was involuntarily discharged for psychological reasons after she reported being repeatedly raped and sodomized by a higher-ranking enlisted soldier in Baghdad two years ago. "It would have been better for me to have kept my mouth shut," Wainwright says. Oh, and about that 2.6 soldiers per 1,000 figure? Other reports show that 6.8% of active duty military women reported unwanted sexual contact, so the problem is probably bigger than the Army is willing to acknowledge. General George Casey has promised a "zero tolerance" policy for sexual assault in the Army, but with with a culture of deference based on rank, will soldiers really be willing to narc on someone higher up on the totem pole? Rate of Sexual Assault in Army Prompts an Effort at Prevention [WSJ] Earlier: Don't Ask, Don't Tell, And Try Not To Be A Woman Is The Military Finally Going To Do Something About The Sexual Harassment Of Soldiers?